Electronic Industry Supplies has gained the South African distribution agency for Stannol, a German company specialising in products for the electronics manufacturing market. Stannol’s product range includes solder wires, solder pastes, flux, solder bars, soldering equipment, measurement and testing equipment, conformal coatings and various accessories. The Council for Scientific and Industrial Research (CSIR) has partnered with Right ePharmacy, a company that dispenses, distributes and collects medication, to develop an innovative pharmacy automation robot for medicine dispensing. The AVA34 robot works like an ATM, using robotic technology to label and dispense chronic medication. It can pick up to 900 sachets, serve up to 10 pharmacists, label up to 550 sachets, and load up to 120 different medicine items, all within an hour. This cuts the waiting periods at clinics and hospitals, relieving pressure on the public healthcare system. Minister of Communications, Ms Stella Ndabeni-Abrahams, teamed up with Nokia to host a Fourth Industrial Revolution (4IR) Innovation Day at the multinational’s corporate office park in Centurion on 15 March 2019. The event saw government officials, young people who are beneficiaries of the TechnoGirl programme and students at the Leadership in Motion Academy (LIMA), exposed to technological innovations that improve the quality of learning, conservation, transportation and fashion, amongst others. The minister is the TechnoGirl brand ambassador, an innovative job-shadowing programme for girls, with a particular bias towards science, technology, engineering and mathematics (STEM) careers. Department of Trade and Industry (DTI) minister Rob Davies has highlighted the benefits of the newly launched Atlantis Special Economic Zone (SEZ). A combined R1,8 billion is expected to be invested in the SEZ by 2022, with the creation of 1 200 direct jobs. A total of 24 000 full-time equivalent jobs are also expected to be created over the SEZ’s 20-year lifespan. This is in line with the department’s industrial policy and will contribute towards the objectives of the National Development Plan (NDP). Sierra Wireless reported results for its fourth quarter and fiscal year ended 31 December 2018. For the fourth quarter, revenue was $201,4 million (up 9,7% from the fourth quarter of 2017) and EPS (earnings per share) was a $0,11 loss. Revenue for the full year totalled $793,6 million (up 14,9% from 2017) and EPS was a $0,68 loss. 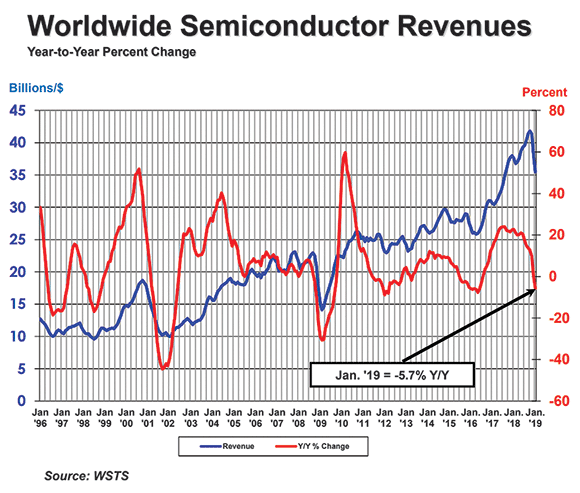 The Semiconductor Industry Association (SIA) announced that worldwide sales of semiconductors reached $35,5 billion for the month of January 2019, a decrease of 5,7% from the January 2018 total of $37,6 billion and 7,2% less than the December 2018 total of $38,2 billion. Regionally, year-to-year sales increased slightly in Europe (0,2%), but fell in the Americas (-15,3%), Asia Pacific/All Other (-3,8%), China (-3,2%) and Japan (-1,5%). For 2019, a steep 24% drop in the memory market is forecast by IC Insights to pull the total semiconductor market down by 7%. With 83% of Samsung’s semiconductor sales being memory devices last year, the memory market downturn is expected to drag the company’s total semiconductor sales down by 20% this year. Although Intel’s semiconductor sales are forecast to be relatively flat in 2019, the company is poised to regain the number 1 semiconductor supplier ranking this year, a position it held from 1993 through 2016.